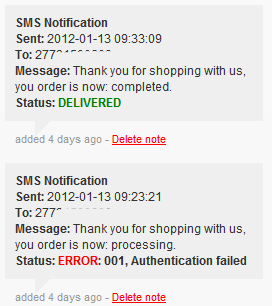 We appreciate your feedback about your support experience with WooCommerce, developers of Clickatell SMS Notifications. This helps us maintain high standards on the WooMarketplace, and helps WooCommerce improve. The Clickatell SMS Notifications plugin for WooCommerce allows you to keep customers updated on the progress of orders by sending them SMS notifications when their order status changes. SMS Notifications are fully customizable via the settings pages, giving messages a personal touch by adding order totals, first names and the shop name. Enable/disable notifications depending on the order status. You can receive delivery reports that are integrated in the WooCommerce order notes system, showing when SMS messages were sent and delivered or not with a short error message. You can send a fully custom SMS message via an order. This extension requires a Clickatell Central API account in order to send SMS.